This January seemed to be a good month for indie VGM album releases, even with my limited exposure to news on that front. So for this week’s post, I thought I’d highlight a few of the new releases I came across. This Vancouver group touts itself as a medley band, which is more accurate than to say they’re arrangers. After the first track on this first studio recorded album of theirs, there isn’t a lot of original interpretation or expansion of the source tracks, and focuses on straight performances weaving together many songs into five mega-mixes. However, the combination of great instrumentation, solid performance, and smooth transitions between the source material makes for great, engrossing ear candy that both grabs and holds your attention and pays a very satisfying homage to the original tracks. When you have a collaboration of musicians from VGM cover bands such as Materia Collective, the Triforce Quartet, and Tetrimino, you can expect high quality results. The Travelers’ namesake album delivers on that promise with lush European folk arrangements of songs from various (mainly older) games, in many cases really showing the potential of these classic soundtracks. There are very occasional moments when songs become a little dull or repetitive, but overall, this album is very lovely. It’s also the only album in this list that isn’t free to download, but with professional-grade production quality and I don’t think a single synthesized instrument, the $7 price tag is a bargain. This latest album from VGM community and repository extraordinaire OverClocked ReMix will probably be a treat to fans of EDM and drum’n’bass (as well as Super Mario RPG), as those styles make up the bulk of the three-disc album. There’s a bit more distortion and chippy sounds, even from familiar names in the VGM community, than I tend to prefer, but some of it works for me, and there’s still a bit of variety. Joseph “XPRTNovice” Zieja, as always, does not fail to surprise with his contributions, including an arrangement that turns the bizarre, Quentin Tarantino-esque “And My Name’s Bukki (Booster)” into a haunting orchestral expansion worthy of any mindwarp movie trailer. A couple months ago, I made a post sharing some music on my ‘feel better’ playlist, closing out with the soundtrack of Secret of Mana. While Secret of Mana is a very effective stress reliever for me, that wasn’t the point of the post, and it wasn’t the soundtrack I meant to mention as part of it. The soundtrack I actually meant to include with that post was for Super Mario RPG: Legend of the Seven Stars. The original Super Mario RPG was an adorable, hilarious, and incredibly fun game, and it had a soundtrack to match. The tunes are catchy and cute while still having good depth and suiting the game perfectly, and something about them always makes me smile when I come across a track, especially when listening to music on shuffle. Even the track titles make me smile when I see them, with names such as “The Road is Full of Dangers”, “The Road is Still Full of Dangers”, “Hard Working Moles Are Good Moles”, and “Fight Against Smithie, Who Likes Transforming”. It was not easy to find the soundtrack back in the early 2000s, and in fact I sold my Nintendo 64 to get the money for it when I did. I have never regretted that decision. It’s an odd choice to be one of my favourite soundtracks, to be sure, but I couldn’t love this soundtrack more, and it never does fail to make me smile. Posted by thejinx in music, Uncategorized. Now that (American) Thanksgiving is done and gone, I thought I would share some holiday-themed music for this week’s post. This song is a classic, and for years, it was pretty much the Christmas video game arrangement, at least in my collection. It’s a masterfully performed and seemingly effortlessly blended arrangement of songs from Super Mario World together with “Sleigh Ride”, “Have Yourself a Merry Little Christmas”, and “Jingle Bells”. Sometimes the tunes trade off having the spotlight, sometimes the Mario music makes a pleasant backdrop to the classic carol, and sometimes both songs are played at the same time on different instruments. The effect is flawless and catchy and delightful. There were a number of great tracks on 2014’s Super VG Christmas Party, but this one was an absolute gem. The source material is from the original Super Mario Kart from 1992. The artist here took the original 30-second bossa nova tune and turned it into a fantastic 3:21 crooner ballad with lyrics about Mario Kart. And also Christmas. A lovely piano medley arrangement of several themes from various Final Fantasy games and Parasite Eve woven together with the classic “Carol of the Bells”. Dale North, also of OneUps fame, has made a few Christmas-themed video game arrangements over the years, though I think this one, mixing a theme from Lufia II with “Silver Bells”, is my favourite. A lot of Christmas VGM is more like this – it doesn’t have any actual Christmas music and is just an arrangement of the original track from Final Fantasy VIII, but the instrumentation and tone have a Christmas-y feel to them, and it’s just a lovely song. Happy holidays! I hope you enjoyed these songs. Do you know of any other holiday video game music/arrangements? Feel free to tell me in the comments, I always love discovering new music! In 2013, a group of indie musicians got together to create Spectrum of Mana, a 3-disc album of arrangements from the Super Nintendo game Secret of Mana. I enjoyed that album; some of it was not to my taste, but largely I really liked the songs. When I heard that the same group was putting together a new album called Chronicles of Time based on the SNES game Chrono Trigger, I figured it would be much the same. Well, it ended up being rather bigger, to the tune of 5 discs, almost 6 hours of music, and over 200 contributors (!). The album launched a few weeks ago, so it seemed fitting that it would make a good topic for one of my Music Monday posts, and I’ve spent the past several days listening intently to give, well, I suppose as proper a review as I can manage. The album was set up in much the same way as Spectrum of Mana, with almost all instrumental arrangements covering a wide range of the source material, organised per disc by genre, with a lot of accompanying artwork. There’s a lot of live instruments, a lot of collaboration, and the production quality is very high. The first disc largely consists of the type of standard rock arrangements you often hear from indie arrangers, particularly live ones. There’s a track or two in acoustic, a little bit of funk and jazz/fusion mixed in (as well as one R&B track that wasn’t to my taste), but generally, there’s a strong focus on electric guitars, bass, and drums, not too heavy – runs on a scale roughly from AC/DC to 90s alternative rock – and generally fairly upbeat. There’s a good variety in the sounds for as consistent as it is overall and I love the directions some tracks took the source material, particularly “Runnin’ in Circles” by Ivan Hakštok & streifig and “Critical Heat” by Grospixels. The second disc has a lot of the same musical theme as the first, though it adds in a bit more variety to the typical rock model with some electronica and a touch more of the jazz/fusion and funk from the first disc. There’s also a three-part chiptune medley from Derris-Kharlan, who had a similar medley in one part on Spectrum of Mana. While I’m starting to get tired of chiptunes, Derris-Kharlan gives it a lot of depth and movement and after giving both a chance, I’ve ended up thoroughly enjoying both. Overall there’s a lot of depth of sound in both this disc and the entire album, and the arrangements here are solid. I’m always impressed when a musician can take a less than 10-second source and expand it into a full song, so one of my favourites was “Norstein Bekkler’s Song of Horrors” by, once again, Ivan Hakštok, as well as “Epoch ~ Wings of Time” by Kirby’s Dream Band and “First Tentacle of Mars” (a play on the original title “First Festival of Stars”) by the group of musicians known as DROIDEKKA. The third disc moves away from the electric guitars and heads more into new age, with a bit of jazz, orchestral, and Latin mixed in, and even a wonderful string quartet arrangement that utilises the instruments to their fullest potential. I thoroughly loved this disc, and every track is staying in my collection. Once again, there’s both great variety and great arrangements, and it’s hard to pick just a couple favourites. The fourth disc is the jazz section. Where there’s been hints of it in the previous discs, it jumps to the fore in these tracks, ranging from lounge to swing to blues to salsa and beyond. This ended up being my favourite disc, which came as a bit of a surprise, since I’m all about the new age. There’s just so much movement, excellent arrangement of the source material into sometimes entirely different styles, great horn/sax solos, and such big sound that a lot of these tracks make me smile just to hear them. I absolutely loved “Primevil” by Eight Bit Disaster and “Cantina Automatica” by XPRTNovice (which I discovered last year from a different website, but I loved it so much I have no qualms at all with paying to have it again, and also contains some great humour for fans of the game). The fifth disc got a bit heavier with more punk rock/heavy metal type arrangements. Several of these tracks were a bit too heavy for my taste, and I ended up not enjoying more of this disc than the others. I still liked more of this disc than not, particularly “Arena Rex” by Midee (featuring Ailsean, finbeard, norg, prozax & Snappleman). Overall, it turned out to be a very strong album with a lot to like. I ended up keeping almost 80% of the tracks in my collection, and for almost five and a half hours of quality music? I’d say that’s worth $20. Fans of Chrono Trigger will most likely get a lot of enjoyment out of this album, and if you’re a fan of the Chrono Trigger soundtrack and jazz music, you should definitely check it out. If you’d like more of an idea of what to expect, the group released a name-your-own-price preview disc over at Bandcamp. The full album is available via Loudr and iTunes, and you can get full information on the songs at the project website. Opinions vary widely in the VGM (video game music) community on the place of vocal remixes – that is, arrangements of originally instrumental tracks with fan-written and -performed lyrics. Although they are becoming more common, there are still some who refuse to listen to vocal remixes. It took me a while to warm to the idea of vocal remixes, especially since I heard a few in the early days that were not to my taste. But eventually, I came to judge them on the same merits as any other arrangement – on the quality and originality of the song, rather than the style or instruments used. This week, I’m going to feature a handful of the (now many) vocal remixes I have amassed in my collection over the years. While there are songs with more interesting lyrics or smoother vocals out there, “To Hold You Again” is featured first because it was one of the first vocal remixes I enjoyed enough to save, back in 2004, and helped start me on the road to accepting them. This sweet rock rendition of a track from the Super Nintendo game Lufia and the Fortress of Doom is a classic story about the singer having ruined a relationship he later realizes was a mistake. Nine years ago, well-known remixer and professional singer/songwriter Jillian Aversa made her first solo VGM rearrangement “Prayer,” a version of the Forest Temple theme from The Legend of Zelda: The Ocarina of Time. I still adore that version of that song with its minimal instrumentation more reminiscent of the original haunting theme, but recently, she released “Generations,” an updated version of the track with new vocals. This updated new age version is more melodic, with rolling vocals along the same theme of discovery as her latest original album, Atlantis Awakening. Jillian has done a number of other lovely vocal remixes worth checking out as well. Featured on playlist: Fantasy, perfect to listen to while writing. Modern pop music is not a particular favourite genre of mine, so a song like this, a rendition of “Fragments of Memories” from Final Fantasy VIII done in a modern pop style with an almost hip-hop-esque beat and slightly distorted lyrics, wouldn’t usually strike my fancy. But I find this song catchy with nice variation and the dual vocals complement each other well, and it became a quick favourite. “Dragon Song” gave “Prophesy” from Secret of Mana a different feel using acoustic guitar instead of flute for the opening riff, but it maintains the dark, haunting mood of the original with a song about escape on the wings of a dragon. This song is a little less vocal than the others, but it is a featured element of the song, and the smooth performance adds to the atmosphere. Despite the changes made from the original, this song still invokes the feeling of flight like the original. Block Party – Tetris Plays You! I close out this week’s post with a little bit of levity courtesy of Block Party, a collaboration made up of several long-standing remixers in the VGM community, including Jillian Aversa and her husband, Andrew “zircon” Aversa. Whether it’s something you want to add to a regular music rotation or just want a quick laugh, take a listen to this vocal rendition of a theme from Tetris, featuring lyrics which personify each of the different shapes in the classic game into themed characters such as the nerdy ‘Z’ block and the French diva ‘L’. Maybe I’m just speaking from the perspective of someone who doesn’t really understand the work that goes into making music, but it amuses me to no end that this group put together such a solid and full-depth performance of an entirely comedic song based on a 30-year-old video game. That’s it for this week! As before, if there is any song, album, or artist you would like me to be aware of, please comment and let me know. See you next time! Testing the waters with a regular feature in which I highlight/share some music I really enjoy. Mostly, this will involve indie re-arrangements of video game music, because that’s how I roll and because it’s generally pretty easy to link to free, legal downloads for it. I’ll admit my music theory is weak, so I might not be able to describe the songs I feature in technical terms, but I love what I love, and if one person gets to enjoy a new song out of it, I will consider it a success. For my inaugural post, I’m going to feature one of my all-time favourite songs: “Time Circuits”/”Corridors of Time” from the SNES classic Chrono Trigger. Clearly, I’m not the only one to enjoy this track so much, as it has been done over and over again. The bonus to it being so popular is inevitably that means there are several very well-done arrangements out there. This week I’m featuring a selection of my favourite renditions of this well-loved theme. “Time Chill” is at least ten years old now, but it remains a favourite. As the title might suggest, mv turned the tune into a somewhat jazzy rendition. What I love about this version is that despite taking a slightly different approach to the source, it feels like this is exactly what the original track was meant to sound like. In this version, Ashane took the original ~90 second melody and turned it into a 10:29 rock ballad, starting off gentle and building as it goes. The questionably voiced lines from the part of the game when the source music plays might not be to everyone’s taste, but to me, those have become as much a part of the music as the guitars, bass, and drums. Featured on playlist: Road trip, because nothing makes the time and miles go by quicker than listening to 3-4 songs and finding an hour has passed. This ambient rendition goes all the way back to 2002; I found an updated version from a few years later while searching for the download link, but I prefer this original posting to RPGamer. It’s long, smooth, and mellow, and I still recall the first time I played it on the radio show I was part of around that time, when I was a bit uncertain about playing video game remixes, and this one was warmly received by crew and listeners alike. I originally discovered this song on a different website where it was titled “Corroder of Time,” a pun on the original title that still amuses me. Unlike other rock arrangements of the tune, this one turns the source material into a heavier song, despite keeping at least close to the original beat, truly turning the track into a hard rock remix. Bonus final track comes courtesy of the Japanese band MintJam. They recorded an amazing version of “Corridors of Time” which I can unfortunately only link to on YouTube, as it was commercially released and therefore not available as a free download. I adore their rendition for the instruments and the depth they gave the original song, including an engaging drum beat and smooth vocals. I hope you enjoyed this brief foray into my music collection. If you have any suggestions for other tracks, artists, or albums for me to check out, please feel free to comment. I always love discovering new music. See you again next week with a new feature! Thanks so much to all of you who visited my table at Fan Expo recently! 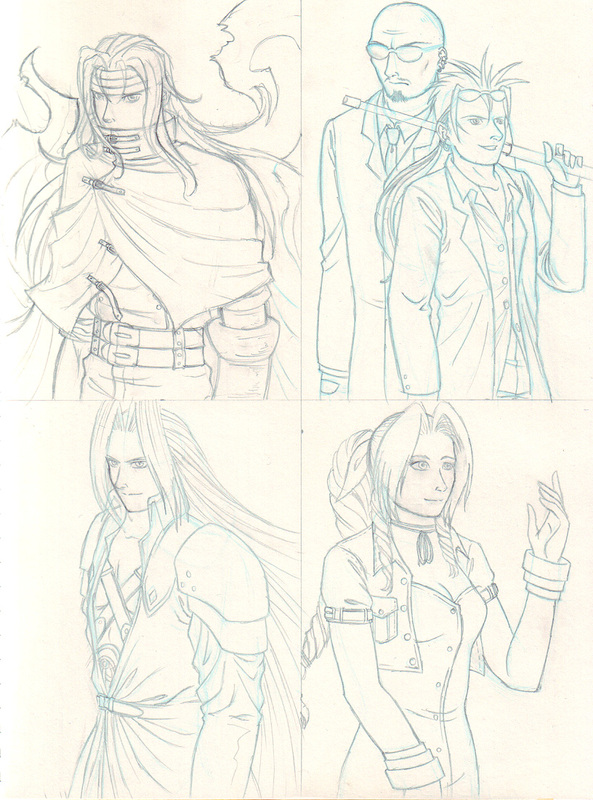 I have to admit, of the conventions I’ve been to, that one has the best artist’s alley, and I love being a part of it. I had every intention yesterday to veg on the couch and play Fire Emblem: The Sacred Stones. Instead, this happened. 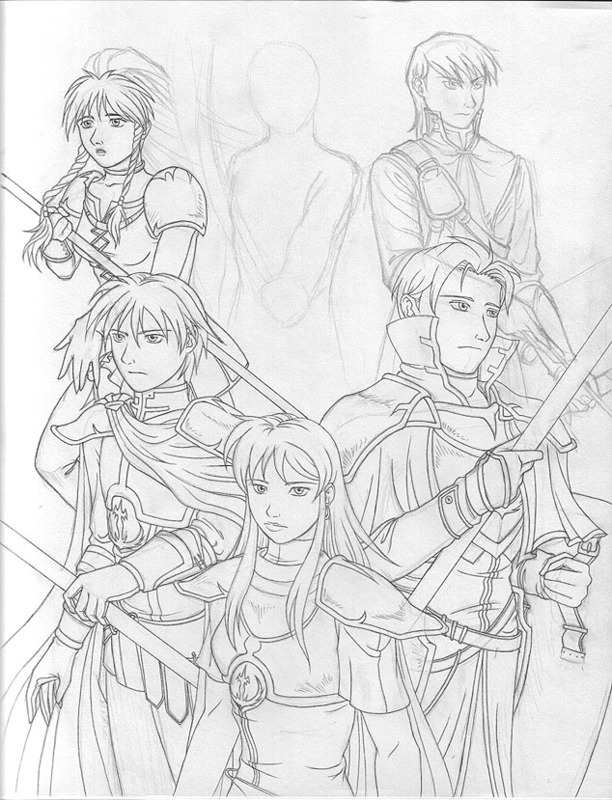 Eirika, at front and center, was sketched late Saturday night, and Innes, at top right, was just sketched now, but all the other work was done yesterday afternoon. I guess all the art I didn’t do last week was saving itself up for this. 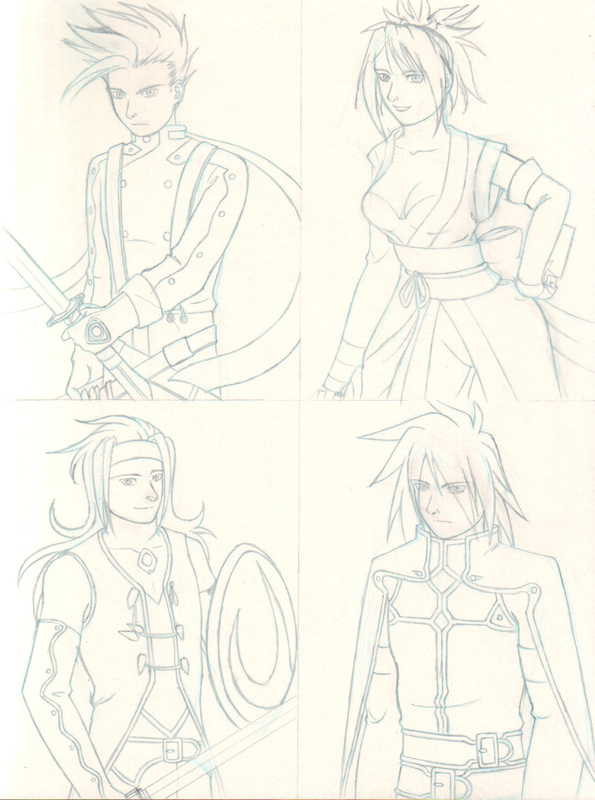 From front to back, left to right, the characters are Eirika, Ephraim, Seth, Tana, and Innes, with Joshua to be drawn at back center.